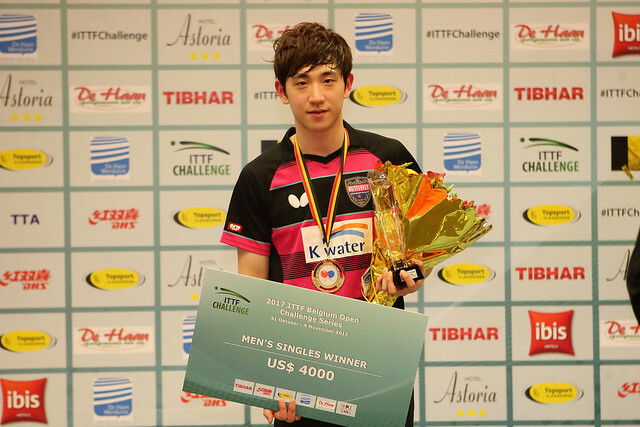 Qualification action drew to a close in De Haan on Wednesday 1st November as the unseeded competitors fought it out for a second day running ahead of the 2017 ITTF Challenge Belgium Open. The Women’s Singles preliminary qualification round featured plenty of exciting encounters as 20 players attempted to book their spots in the main draw, and for Italy there was cause for celebration as Veronica Mosconi and Giorgia Piccolin successfully achieved that feat. Veronica Mosconi, who was restricted to a second position finish in Group 3, recovered from a game down to beat Iran’s Maryem Samet across six games (4-11, 11-7, 11-6, 8-11, 11-7, 12-10) while Giorgia Piccolin was made to work hard for her deciding game win against Danielle Konsbruck of Luxembourg (11-9, 8-11, 10-12, 12-10, 10-12, 11-6, 11-9). Another competitor who required the full seven games distance in the preliminary round was Spanish representative Zhang Xuan, narrowly seeing off a brave challenge from Russia’s Kristina Kazantseva (5-11, 11-2, 11-13, 12-10, 11-4, 7-11, 11-7) to secure her place in the main event. 24 players progressed through to the Men’s Singles tournament as group winners, but there were a further eight main draw places up for grabs as the winners of groups 25 to 40 met in one final round of qualification action. Lionel Weber is one of the players who managed to negotiate the preliminary round, as the Swiss competitor edged to a tight victory at the top of the draw. Portuguese opponent Diogo Carvalho entered the encounter as the higher ranked player and took the fight to Lionel Weber right down to last shot, but it was the latter contestant who emerged from the match with the win (8-11, 11-8, 11-7, 6-11, 10-12, 11-6, 9-11) and will face 31st seed Philipp Floritz in the next round. While Lionel Weber’s victory came as somewhat of a surprise it was business as usual for Anders Lind and Anthony Tran as the Danish and Swedish representatives came through their respective fixtures against Denis Ivonin (11-4, 12-10, 11-6, 10-12, 11-5) and Miguel Vilchez (11-4, 11-9, 10-12, 11-6, 8-11, 11-8). The highest ranked partnership outside of the top eight seeded teams won’t be appearing in the Women’s Doubles competition following a disappointing outing from Hungary’s Mercedes Nagyvaradi and Szandra Pergel, who suffered a three games to one loss in their match against the Swiss duo of Rahel Aschwanden and Celine Reust (8-11, 11-8, 10-12, 7-11). There was a similar story for David McBeath and Samuel Walker in the concluding Men’s Doubles qualification round as the English pairing were eliminated by Paraguay’s Marcelo Aguirre and Argentina’s Rodrigo Gilabert (4-11, 11-7, 11-6, 6-11, 11-13) who have booked a Round of 16 fixture against the fifth seeds Lam Siu Hang and Ng Pak Nam in the process.